Have you ever made a Starflower block? I've made them for swaps in the past and keep thinking to myself that I should make a quilt out of Starflower blocks for myself - because I really, really love them. I have a new layer cake that I want to use for a bed quilt and have been umming and ahhhing about what block I should use. I decided to go with the starflower block. So far I'm pleased with the result. If you've never made one before, here is a quick tutorial on how to make one - using a layer cake and some yardage. Now put your solid 4.5" squares aside as you won't need them yet (and you don't want to mix them up). We're going to make half square triangles with the squares. 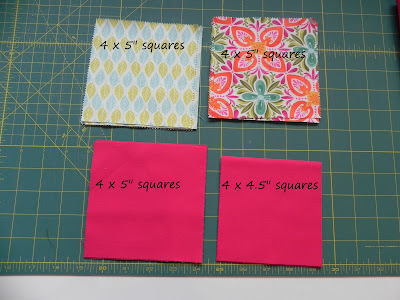 To make your HST's, take 2 different squares and place them right sides facing. Draw a pencil line across 2 diagonal corners. With the line in the centre as your guide, sew 1/4" on either side of your line. Now using your rotary cutter, cut on the pencil line. Open up your HST and press seams open. Sew your rows together and press seams open as you go. 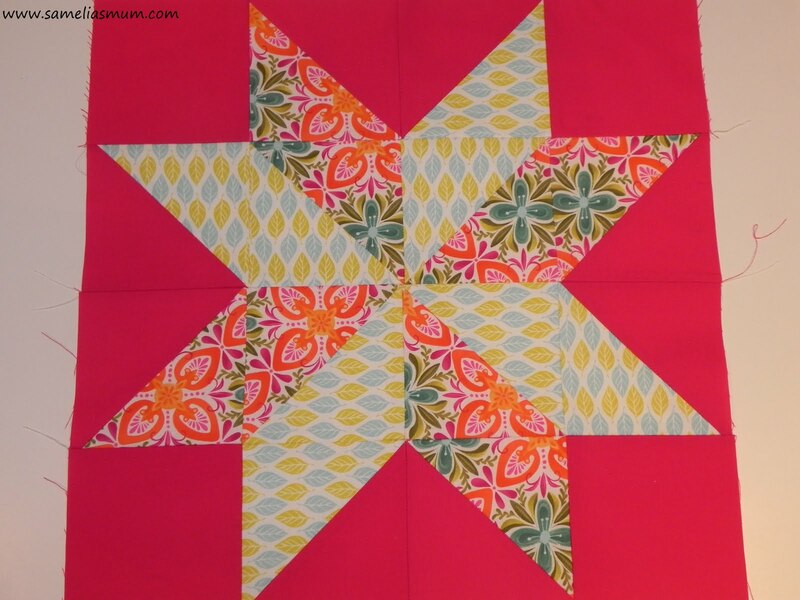 And then put it all together and you end up with this gorgeous starflower block. Thanks for the tutorial. I have a couple of layer cakes too that would look great with that pattern. I was thinking about this block the other day - but couldn't remember where I saw it, or how to make it. Thankyou for this timely tutorial!! Thanks for the tutorial ... it actually looks easy! I am an eight pointed star fan myself. I love it in the Terrain fabrics with the solids. Vey nice. This is going to be a gorgeous quilt. That is a cute block. wow - thanks for that tutorial. I have always thought they were all seperate pieces (ignorant aren't I?). You make it look relatively easy! Hi this is great and looks wonderful in Kate's fabrics. There will be a photo on the flickr page when I get it uploaded. Wow, it looks so easy ! Those are some beautiful solids with that awesome block. Can I ask what solids they are?